From the name, you might think that spinach dip is a healthy, low-calorie choice. Take a close look at the ingredients list, however, and you'll realize this dip can pack a lot of calories. One popular restaurant appetizer order of spinach artichoke dip packs 1,590 calories, making it especially important to watch your serving size. 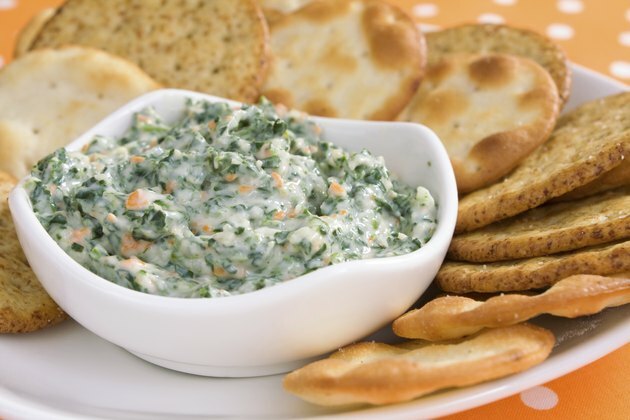 A traditional spinach dip made with cream cheese, mayonnaise, Parmesan cheese, garlic, onion and spinach has about 114 calories per 2-tablespoon serving. A mix of cream cheese, sour cream, olive oil, spinach and onion has about 66 calories per serving. You can reduce the calories further by using reduced-fat versions of yogurt, cottage cheese and cream cheese mixed with spinach, water chestnuts, shallots and lemon juice, which results in a dip with 54 calories per serving. Another healthier variation with extra fiber uses low-fat versions of mozzarella cheese and cream cheese mixed with pureed cannellini beans, spinach, basil, artichoke hearts and garlic. A 2-tablespoon serving of this dip has just 50 calories.